If mo’ money means mo’ problems, one might assume that “No Money, No Problems” also stands true….but you would be wrong. Having no money brings about a whole new set of problems. To be fair, I don’t have absolutely no money. It just so happens that almost every penny I earn is already allocated to a basic need (food, rent, electricity, gas). But it doesn’t stop there. Like so many young professionals in their 20s, I find myself paying back a huge amount in student loans. (I just had to attend that small private university) Add those loan payments to my other expenses and monthly finances start to get a little tricky. But it still doesn’t stop there. Because I have chosen a profession in the arts, up until recently I lived in a land called unpaid internship. Because of this, I had to call my student loan lender about two months ago (well, one of my lenders) and was forced to listen to pop music while waiting on hold. I’m sure the intention for having pop 80s hits play for individuals on the brink of financial disaster is to cheer the patrons who find themselves drowning in a sea of student loan debt. However, I did not find Message in a Bottle comforting whatsoever. Yes, I am sending out an S.O.S. to the world, and it says “I’m broke”. Last month was pretty rough. Through what I thought were missed payment dates, I ended up paying double for a few of my loans. Even with multiple jobs (babysitting, box office, teaching), finances got REAL difficult at the end of April. Two weeks ago, I actually took all my spare change to a Coinstar to add to my grocery fund which was practically my last 20 dollars of the month. But fear not – this is not a sad story! I went to pay my loans this month, and they had already been paid! (So, I guess I was just paying May’s payment early last month? I don’t know. Money is confusing.) Also, apparently I only have to make car insurance payments every two months. (This is very weird to me, but if the balance says zero, I am not going to argue.) This means, I have MORE money than I was expecting to have. A smart person would save and set aside for a rainy day. A smart person would start to think about creating a savings account. Or a smart person might even go ahead and pay June’s loans. What did I do? I spent some of this extra money on three new dresses at TJ Maxx – DUH. They were real cute (and a total bargain! ), but I might need some lessons on financial responsibility. 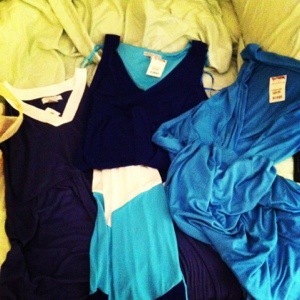 All the dresses I bought were blue. Is blue in? Or do I just have boring, monochromatic taste?